Today marks the official beta release of Yahoo! 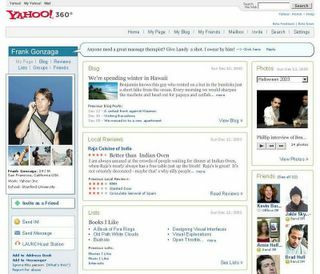 360 -- which integrates blogs and social networks into the complete Yahoo! system. In true social network fashion (a la Orkut and gmail) the beta release is being distributed by invitation only. 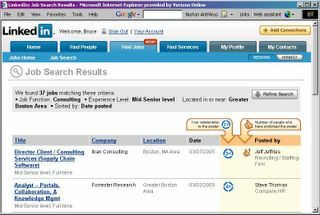 Charlene Yi of Forrester Research has written a promising review, including this screenshot. See also this collection of related news stories compiled by Ross Mayfield of Many 2 Many. I used to race bikes in college and still follow the sport, especially every July for the Tour de France. No man's land is a hopeless and lonely place doomed to be swallowed by the multitudes (or peloton as bike riders like to say). 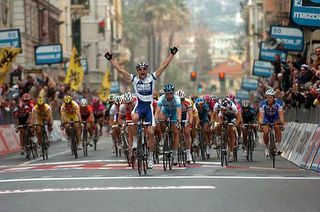 Here we see Alessandro Petacchi winning last week's Milan San Remo, the pinnacle of Italian cycling classics. Petacchi is alone in front at just the right moment---a moment only possible thanks to the strength and strategy of his Fasso Bartolo team. Understand better how an organization really works. The meeting will include practical case studies, a participatory social network analysis of ODLG with discussion, and an overview of resources you can use to grow your practice with the power of social network analysis. Sometimes a lot of complexity lies behind a simple and profound message. Social network analysis works that way---by providing us powerful analytical tools that are hidden far in the background at their most influential moment. As we rise above the technology, the purpose of our efforts becomes strikingly clear. Peter Gloor's TeCFlow converts a database of emails into an animated social network. This system was originally designed to handle only Eudora email format, but recently it has been upgraded to handle Outlook mailfolders as well -- broadening its appeal considerably. Each node is a person on the project, and each edge represents an email that I was at least cc'd on. If I got everyone else's email folders fed into TeCFlow, then the resulting picture would be of the entire system, not just my view. Even more importantly, I'd like to get TeCFlow to recognize who the members of various mailing lists are. Right now, the graph represents each email list as an individual node, rather than showing who is really receiving those group emails. For another well-studied perspective on visualizing email history as social networks, see Soylent, the PhD work of Danyel Fisher (formerly UC Irvine, now doing community technology at Microsoft). I heard Danyel give a great talk on Soylent at Sunbelt XXV, and only wish that Soylent supported Outlook. My brain is feeling a bit constipated lately. Wait, that's gross. Let's try this metaphor: like a squirrel hoarding nuts, I keep stuffing my cheeks with more research leads and other interesting to-do's. I doubt that you, dear reader, are keeping track, but I'll remember February's promises one of these days. And soon. In particular, I'll explore the wonderful online notes for "Organizational Social Networks" by Steve Borgatti, and then I'll tell all my stories from Sunbelt XXV. By way of prepation, I've been delving more deeply into social network visualization software. I just got a beta copy of Krackplot 4, which is great for making dramatic animated morphing networks as shown here. 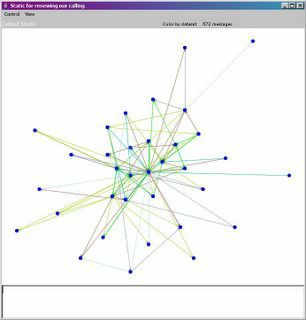 I've also been fiddling around in various ways with UCINET, Pajek, InFlow, and Netminer -- a few of the notable software packages out there for social network analysis. Zero is nothingness. The void. A number better left to mathematicians and zen monks. One is unity. I am one. The universe is one. One is a great number with deep psychological implications, but one is not social enough to be our focus. Two is you and me. A relationship. For the first time we have real communication, which we can also write and record in binary if we wish. Things are now very social, but lacking context. What are we going to talk about? Three is you, me, and other. A one-child family, a love triangle, a community. You and I always have something to talk about (the other). Three is smallest group in which I can be outvoted. Three is where the most fundamental social network action takes place. For a rather mind-blowing glimpse at how deeply sociologists have considered the number three, see "The Significance of Numbers for Social Life," which recounts the life and work of Georg Simmel. Of course, social network analysts aren't the only people obsessed with the number three. Saint Patrick, for example, favored the traditional shamrock for its leafy reference to the Holy Trinity. The March 2005 issue of the Harvard Business Review features the article, "A Practical Guide to Social Networks," by Rob Cross and Jeanne Liedtka of UVA, and Leigh Weiss of McKinsey. The modular response network was the biggest "aha" for me in the article. It's appropriate in situations where collaboration involves creatively combining expertise from well-defined roles. These roles effectively become the agents of collaboration. For each role, the people filling it become somewhat interchangable experts. When an expert acts effectively in his role, he does what he knows and respects the domains of other experts from other roles. There's a great chart summarizing these three basic types, so that managers can identify which type of network is appropriate to their situation and then act accordingly. You can buy a download of the article here. "Saying that networks are important is stating the obvious. But harnessing the power of these seemingly invisible groups to achieve organizational goals is an elusive undertaking. "Most efforts to promote collaboration are haphazard and built on the implicit philosophy that more connectivity is better. In truth, networks create relational demands that sap people's time and energy and can bog down entire organizations. It's crucial for executives to learn how to promote connectivity only where it benefits an organization or individual and to decrease unnecessary connections. 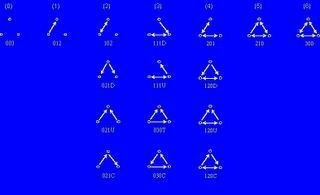 "In this article, the authors introduce three types of social networks, each of which delivers unique value. The customized response network excels at framing the ambiguous problems involved in innovation. Strategy consulting firms and new-product development groups rely on this format. By contrast, surgical teams and law firms rely mostly on the modular response network, which works best when components of the problem are known but the sequence of those components in the solution is unknown. And the routine response network is best suited for organizations like call centers, where the problems and solutions are fairly predictable but collaboration is still needed. "Executives shouldn't simply hope that collaboration will spontaneously occur in the right places at the right times in their organizations. They need to develop a strategic, nuanced view of collaboration, and they must take steps to ensure that their companies support the types of social networks that best fit their goals. Drawing on examples from Novartis, the FAA, and Sallie Mae, the authors offer managers the tools they need to determine which network delivers the best results for their organizations and which strategic investments nurture the right degree of connectivity." This looks very interesting. I wish I could go! For more information contact Professor David Lazer at Harvard University. The dynamics of information within organizations is relevant to issues of productivity, innovation and the sorting out of useful ideas from the general chatter of a community. How information spreads and is aggregated determines the speed with which individuals and organizations can act and plan their future activities. This talk will describe new mechanisms for automatically identifying communities of practice within organizations and for elucidating the spread of information spreads within those communities. In addition, a new method for forecasting uncertain events using small groups of people will be presented, along with empirical results that show its efficacy at making predictions in the laboratory and in the real world. Bio: Bernardo Huberman is a Senior HP Fellow and director of Information Dynamics research at HP Labs. His current research is focused on designing novel mechanisms for accessing and aggregating disperse information, as well as enhancing privacy and trust in electronic transactions and negotiations. The main focus is the harvesting of community knowledge within organizations. Previously, Huberman's research concentrated on the World Wide Web, with an emphasis on the dynamics of its growth and use. This work helped uncover the nature of electronic markets, the detailed structure of the web and the laws governing the way people surf for information. One of the originators of the field of ecology of computation, Huberman recently published the book, "The Laws of the Web: Patterns in the Ecology of Information," with MIT Press. Huberman is a Fellow of the American Physical Society, a Fellow of the American Association for the Advancement of Science (AAAD), former trustee of the Aspen Center for Physics and Fellow of the Japan Society for the Promotion of Science, as well as a faculty member in Symbolic Systems Program at Stanford University. He is co-winner of the 1990 CECOIA prize in Economics and Artificial Intelligence and shared the IBM Prize of the Society for Computational Economics. He was also the Chairman of the Council of Fellows at Xerox Corporation and the manager of the Internet Ecologies Group. He has held visiting professorships at the University of Paris, the University of Copenhagen and the European School of Business. This is a pretty cool setup. Next to each job that matches my search criteria, LinkedIn shows me who posted the job and how many degrees I am removed from that person. If I investigate a particular job title, with one more click I can see all the hiring managers in my network at that company. As cool as that is, I was even more excited to see a position on the board that actually interested me. (I am actively looking for new professional opportunities.) So with more than academic interest, I put LinkedIn through its paces, with an eye to reporting my findings here. What did I find? Linked in is helpful, but mostly when I don't really need its help after all. My first attempt to connect via LinkedIn met with a polite rejection. Then with a little more detective work I found a better connection, not a hiring manager but only two degrees away. As I entered my LinkedIn connection request, I got the feeling I was making things too complicated, and sure enough my friend chose to introduce me to my target via regular email rather than through LinkedIn. Seeing how introducing Alice to Bruce will make both her friends happy, Cindy obliges. This is how networking has worked for millenia, with or without LinkedIn. In this scenario, neither Cindy nor David can fully share the joy of introducing Alice and Bruce, and so the networking will probably stall (if it even gets started). Considering these two scenarios, you can begin to see the perversity of LinkedIn. In the first scenario, Alice may need LinkedIn to discover her connection to Bruce, but after that she has no need of LinkedIn's elaborate request-forwarding service. She can just ask Cindy to introduce her directly. In the second scenario, however, Alice may not even know of David's existence, and Cindy may be unaware that David knows Bruce. How will Alice ever know to ask Cindy to approach David? Only with a power-assisted request from LinkedIn. So LinkedIn really can help -- in precisely the scenario when the intermediaries have almost nothing to gain by cooperating. Discussion with Valdis Krebs: What is a "social" network? Congratulations to Valdis Krebs for correctly identifying three out of four of my "mystery quotes" from last week. For those of you not familiar with him, Valdis is a notable entrepreneur of social network analysis with an impressive record of consulting and a nice library of white papers; he has also created one of the more convenient network visualization and analysis tools, InFlow. I have long included his website on my resource list and recommend it to you. I also find that his website has attracted a good audience of Furlers, and so if you read "who is Furling organizational SNA" in my resource list, you are actually seeing who has Furled Valdis Krebs. "Organizational SNA is not a viable economic model." "Network analysis is huge, but not how you'd expect. It isn't organizational. It's at the business strategy level." "I'm not into social networks anymore. Now it's value networks." "Our foundation promotes the production network approach [as opposed to social networks]." In his winning entry, Valdis also shared his perspective on the debate over the relative merits and meanings of social network analysis, organizational SNA, business strategy SNA, value networks, and production networks. As he put it, "We NEVER look at purely *social* networks... it is a mix of social, task, strategy, career, knowledge and innovation networks. See this survey of mine from the early 90s... only Q2 [The Grapevine] is a social network." Q1. exchange information, documents, schedules, and other resources to get your job done? Q2. discuss what is going on in the company, and who is doing what? Q3. seek inputs and opinions before making a key decision? Q4. discuss new ideas and innovations in financial products and services? Q5. discuss customer needs, requests, and feedback? These questions are followed by a section inquiring about interactions with other departments, headquarters, customers, vendors, and databases. It's a nicely done survey. All this gets me wondering what we are getting at with the word "social," so I looked it up. Definition one is "involving allies or confederates," which I translate to "involving relationships of people." In this context I feel comfortable labeling any network involving people (even with a database or two thrown in) as a "social network," and I applaud those who seek to unify our understanding of diverse networks under the "social network" umbrella. Definition two of "social" is "marked by pleasant companionship with friends." This definition actually feels more natural to me than #1, and provides the context in which we must distinguish social networks from task, strategy, career, knowledge and innovation networks. 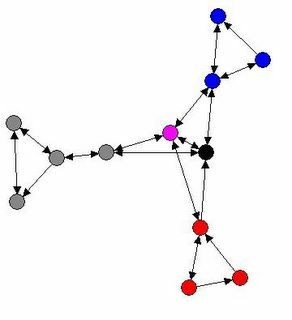 And that is clearly a distinction worth making -- these types of networks not only involve different flavors of relationships, but they also behave differently as networks. For a glimpse of this, see here. The Internet Has Officially Arrived -- The New Yorker is Here! I long thought my favorite magazine of all time was too proud for technology, but in retrospect I should have known that it's a very slippery slope from color photography (which this glossy did not admit to its pages until a desperate revamping in the 1980s) to the Internet. Yes, The New Yorker website, formerly but a digital shadow, now includes actual articles. Someone please tell Al Gore that his invention has officially arrived. In pondering these statements, I did a little research and ran into one of my personal pet peeves, the chaotic maelstrom where business and academic jargon collide. For anyone else intrigued by the above statements and seeking some solid ground on which to discuss them, I recommend the 11-page pdf "How Do We Define Value Chains and Production Networks" by Timothy J. Sturgeon of the Industrial Performance Center at MIT. For additional perspective, see also this chain of posts. I am pretty blogged-out this week, though you wouldn't know from reading Connectedness. The Six Sigma Church initiative has been going swimmingly. The online survey produced a lot of provocative information, which a small group has boiled down to something at least a little less overwhelming. The next step is feeding the information back to the congregation, to be discussed over a series of neighborhood gatherings. The "easy" part of that is information distribution. This week I created a new special-purpose blog to provide everyone easy access to the report. I expect this to be a disposable website and not much of a true blog, but if it grows into a true community instrument (see also this), I'll be sure to report that here. In any case, I'm very happy with how it all turned out, but Blogger really did try my patience as it insisted on republishing a lot more often than I really needed to during the creative process. I also strained the WYSIWYG editor beyond its limits a few times. "Seventy years ago Kurt Hahn, a progressive German Educator and founder of Outward Bound, insisted that one’s weakness is one’s greatest strength. He believed a weakness presents an opportunity to try new things, overcome fears, and test perseverance in a way that our natural talents cannot. Above all, weaknesses are a doorway to compassion. Let us clearly define our challenges and engage them as opportunities."